Digital De-cluttering is becoming more important as we try to transist or blend both a ‘digital’ and ‘paper’ based world. Some businesses have gone ‘paperless’ but in order to do that you must implement good systems across your business. I recently had an epiphany when working with a client as we started to ‘digitally de-clutter’ her laptop, iPad and the files that she was working with. For me, it’s like walking into a room full of clothes from the floor to the ceiling. Since then, they have been able to work much more productively and file documents as they are created into the correct folders rather just leaving them on the desktop. 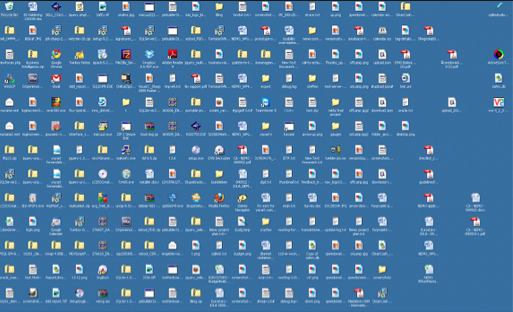 Does your desktop or iPad screen look like this? The biggest complaint I hear from both clients and those who I work with in workshops is ‘where do I start’? It is very true that if you don’t have systems in place when you are working with files on a computer, or even filing emails then it can make it difficult to find what you are looking for regardless of how good your search function is. Name files: and be consistent in how you name them. A good way recommended by David Sparks (author of ‘Paperless’) is to have YY-MM-DD and then he recommends adding a space and then a hyphen followed by describing the document. An example is 2013-10-20 – digital decluttering blog post. This has made a huge difference to the way I have been filing documents lately. I don’t spend as long trying to find a file or working out exactly what I name it. Remove ‘unwanted files’: Like with anything, we are carrying ‘digital baggage’. The biggest problem that we face is not dealing with it until we have run out of room whether it’s on our iPads, smartphones or computers. There are often apps or software that you can download to help with tidying up unwanted files/documents/photos and even duplicate copies on your iTunes. 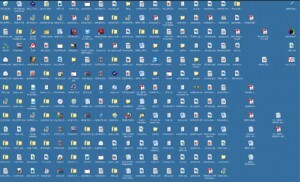 Organise Folders (and that includes on your mobile devices) and regularly tidy up your desktop. Archive regularly – this includes backing up your hard drive with an external hard drive and also to a cloud based storage such as Dropbox, Google Drive or Box. You don’t realise how valuable your hard drive is (until is crashes) and you lose everything. Saving your files in at least three places means that if your external hard drive crashes as well, you still have a backup in place. If you are a Mac user, then setting up Time Machine is a must. For PC, there are similar options. If you have mobile devices, also back these up as well by backing up to iCloud or syncing with your computer. Dropbox is very handy on a mobile device providing easy access to documents, photos and videos when needed. Have consistency across platforms – Brainstorm up to 30 different headings for your folder names across platforms. 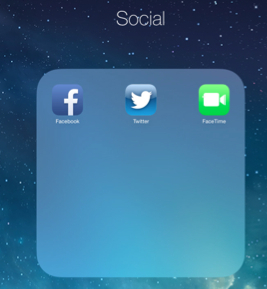 This includes folders on laptop, cloud storage such as Dropbox, Google Drive, Box and your email folders. Then move files to the correct folder. Consistency is the key and this will help with ‘digital decluttering’. If you need help with ‘Digital De-cluttering’ contact Tech Coach HQ to see how we can help you ‘Digitally Organise’ your life.